Caraval promises a magical game but only delivers on the frustration of being tricked. 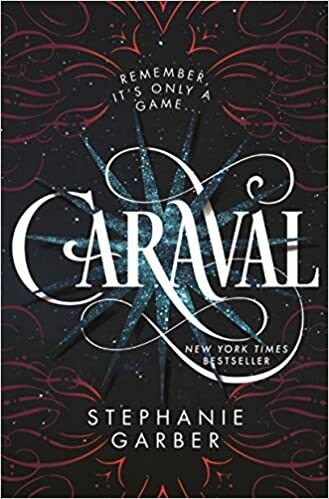 With a brilliant book cover (yes, I’m guilty of judging covers these days) and a title with a hint of magic and mystery, Stephanie Garber’s Caraval seemed right in my YA wheelhouse. I wanted to like it. I wanted to dive into a carnival landscape and follow two sisters around while they unravel a deadly game. I was ready for the colorful cast of characters. Except the novel only provides a skeleton of what’s promised on the back flap: “Whatever you’ve heard about Caraval, it doesn’t compare to the reality. It’s more than just a game or a performance. It’s the closest you’ll ever find to magic in this world.” The novel follows two sisters—Scarlett and her younger sister Donatella—who both dream of attending the famous Caraval, partially as an escape from their violent and abusive father. Scarlett writes to the Caraval’s creator, named Legend, for years before she finally receives the offer she’s been hoping for—tickets to the performance. One for her, Donatella, and Scarlett’s fiancé, a man she has never met. The only problem: the marriage arranged by her father happens only a few days after the Caraval, so it would be nearly impossible for Scarlett to attend both. Donatella knows how much attending the Caraval means to her sister, and she has a plan to use the Caraval as a chance to finally escape their father’s abuse. While the plot promises plenty of tension (though abuse as a character’s driving force usually worries me), I was eagerly turning pages to reach the Caraval descriptions. I was ready to be inspired by the wonder of this invented place that had so captured the imaginations of Scarlett and Donatella to the point it also captured my imagination. I felt promised this type of wonder as a reader. Garber rarely delivers on this promise of magic. Moments of imagination were spread throughout the novel, such as a tattooed fortune teller who learned about his visitors by which of his tattoos they looked at—but such moments were often not fully realized. For example, a few pages after the fortune teller, Scarlett enters a kissing tent. Considering the sexual tension between her and the male main character, Julian, I felt excited to see the kissing tent, hoping for interesting descriptions of young love, adventure, ideas of first kisses, attraction, or a darker twist on these beloved tropes. Instead, the tent was described as mostly empty and Scarlett bought an elixir of protection, which felt like a let down as a reader. Don’t get me wrong, there’s plenty of sexual tension throughout the book (though it starts off weird with Scarlett being kidnapped by Julian and nearly drowning), but it often felt misplaced or awkward—such as Julian trying to convince Scarlett to sleep in the same bed as him even though it made her extremely uncomfortable. Some of Garber’s best moments are when she describes the clothing. One of Scarlett’s dresses changes depending on her mood, and I loved the tight details of each new piece, from bustles and lace to risqué sleeveless tops and sweetheart necklines. Garber imbued the wonder into the clothing while the rest remained hard to visualize, even confusing at times, such as a description of a carousel that was unclear on size, speed, placement, or the ridable creatures. Had it been a passing description, perhaps it need not be so fully realized, but Garber cues the reader into its importance right away. While the descriptions were not what I had been expecting or hoping for, I would’ve been more forgiving if the Caraval were not set in a secondary world. Other than the addition of magic, little seemed separate from a historical fiction set in the 1800s. I wasn’t sure why Garber invented a whole new place rather than add a taste of magic, such as in The Night Circus by Erin Morgenstern, which Caraval is often compared to. Using a historical version of our world might have made the light prose feel less spare since the reader doesn’t have to imagine (or reimagine) everything. After finishing the book, it wasn’t apparent to me why the world needed to be a totally new secondary place. The mainstream reviews of Caraval feel like a totally different book than the one I read. Again, I wanted to like this fantasy. I wanted to be swept away in a dark carnival game, but thin descriptions, confusing prose, an unexplored secondary world made for an unsatisfying read, plus the amount of abuse (emotional and physical) spread throughout the novel had me cringing rather than rooting for Scarlett, who, in my mind, never seemed to overcome her victimization, even in the final turn of Caraval’s game. While I do not have experience with the abuse detailed in the novel, it wasn’t apparent to me what I should take away from those scenes. Overall, while Caraval was one of the hot picks of 2017, it didn’t thrill me. Nerd Coefficient: 3/10 “Very little good I can say about this.” Read more about our scoring system here.